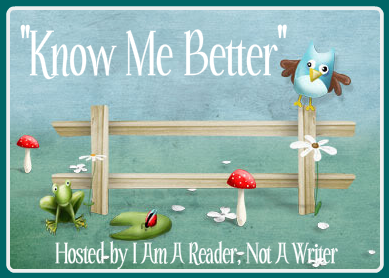 Know Me Better, Week 1 ~ Love.Life.Read. Good question…I mostly like to read on the couch and curled up in a blanket right now. During the nicer weather, I like to read outside as well. I would say I am a fast reader, especially if the book hooks me. Neither LOL I like either spring or fall the best. Spring because of all the gorgeous flowers and trees coming back from their dormancy and Fall because I love the beautiful weather, football, apples and cider. In high school, definitely dare. Now as an adult, probably truth but I still like a good dare every so often.